Festal Evensong at Dafen with joint Choirs. The second Nave window depicts the miracles of Our Lord. These include: -The walking on the sea; the raising of Lazarus; the feeding of the five thousand; the miracle at Cana of Galilee; the restoration of Jairus’ daughter; the healing of the blind man; the healing of the ten lepers. The window was dedicated “To the Glory of God and the memory of Francis Nunes who died January 15th, 1873 – ages 30 years”. 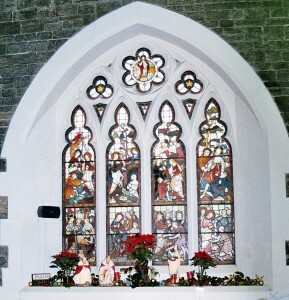 The window was erected by his widow, Tryphene Mary Melville Nunes.